The Valkyrie is a massive, Amerika Bomber used by Hydra during WWII in the MCU (Marvel Cinematic Universe). It is armed with 8 parasite-suicide-atomic-bombers. In Captain America: The First Avenger, Captain America crashes the plane into the Arctic, freezing himself for the future. The Valkyrie has 10 engines, 8 props, 4 on each wing, and then 2 jets. My plane is going to be to using 4 props on the wings, 2 on each side. And then use 2 EDFs in place of the jets. However, I might end up using 3 F pack motors on each side. 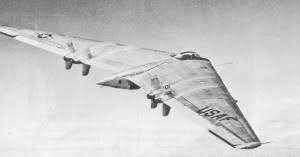 The Valkyrie was inspired in the movie by the Horten XVIII, the Amerika Bomber version of the famed Horten 229. I have high hopes that this aircraft will be a viable airframe, however the size and scope of the project is daunting. Additionally, if I have time, I will try to build a parasite bomber, and hopefully be able to drop it. The Valkyrie is a massive, Amerika Bomber used by Hydra during WWII in the MCU (Marvel Cinematic Universe). It is armed with 8 parasite-suicide-atomic-bombers. In Captain America: The First Avenger, Captain America crashes the plane into the Arctic, freezing himself for the future. The Valkyrie has 10 engines, 8 props, 4 on each wing, and then 2 jets. My plane is going to be to use 4 props on the wings, 2 on each side. And then use 2 EDFs in place of the jets. However, I might end up using 3 F pack motors on each side. This one will be great! Looking forward to it! Going to be very cool! Are you thinking one big piece, or sectional for travel and storage? I am going to be watching this thread for sure! Plans V1 have been printed and I’m reading tic hesistantly start cutting. 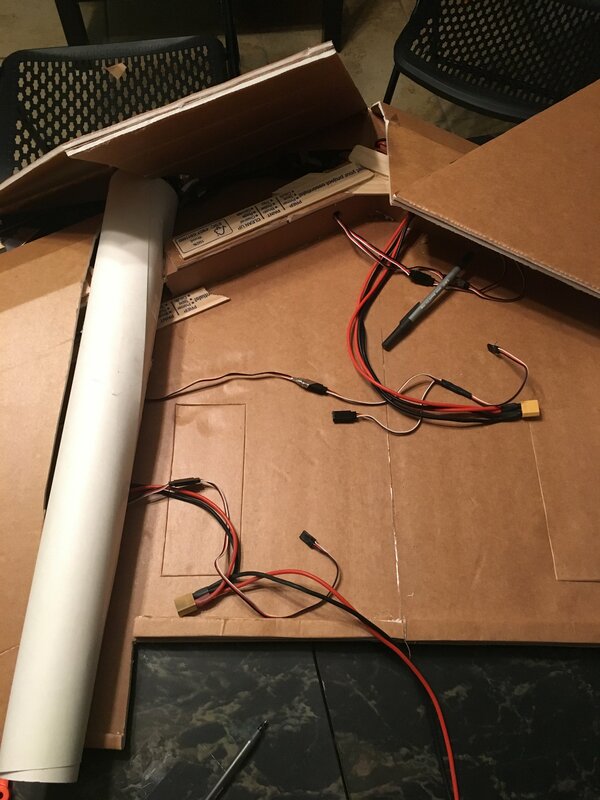 Ok, so I've cut out almost all of the parts so far. 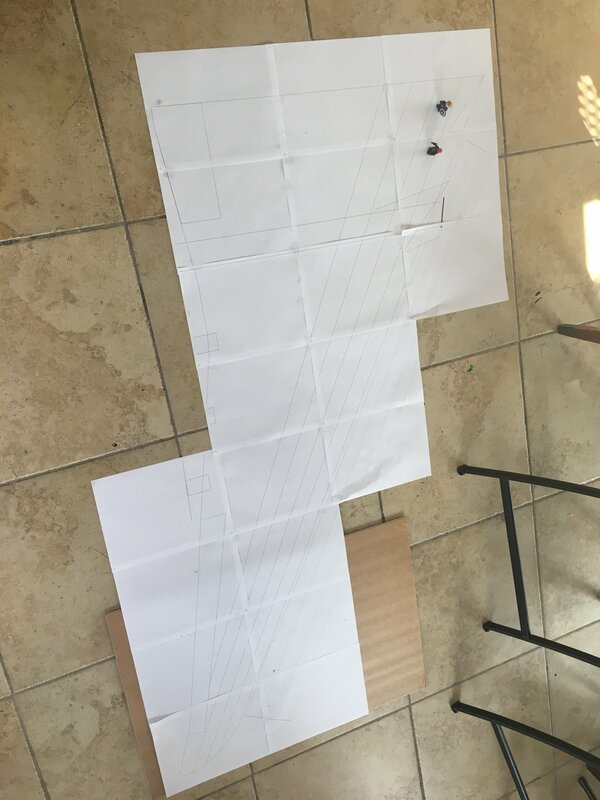 I've used 9 sheets of foamboard and I haven't yet created the overtop central covering piece for the wing. The spar for each wing is 60"! I'm going to be heavily reinforcing that spar with wood. I've decided to use 6 2300kv F pack motors for the back engines. The exhaust from the EDFs has to be moved over to the sides. This means I'm going to have another control surface at the rear of the plane. This means I'll have four control surfaces and just use elevons. I have come to a bit of an issue though, and that is channels. The main question is, do I sacrifice either the 5th or 6th channel so that I can have differential thrust. As it stands, I'm going to control the EDFs throttle with one channel, and the props with another. I could do away with this and have differential thrust but I think it's too valuable to do away with. Lastly, the control surfaces on this plane are not that large, especially in comparison to the Kraken. And that's ok, its a high altitude strategic bomber, it's not supposed to be maneuverable. But the question becomes, how do I ensure that the wing is inherently stable in flight with the control surfaces in neutral. 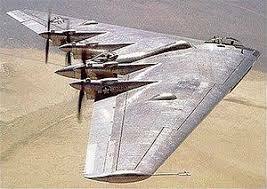 I know that a flying wing needs the elevons to be angled up in the back, and I'm worried I won't have enough elevons to keep that neutrality. I'm not sure if any of this made sense, but if it did, I would love some advice on it. with maybe 2-50mm EDFs at 650kg each - 1.2 so add another 2.6lbs... 12.72 lbs of thrust. This could reduce your Wingspan by 60% to only a mere 6'. 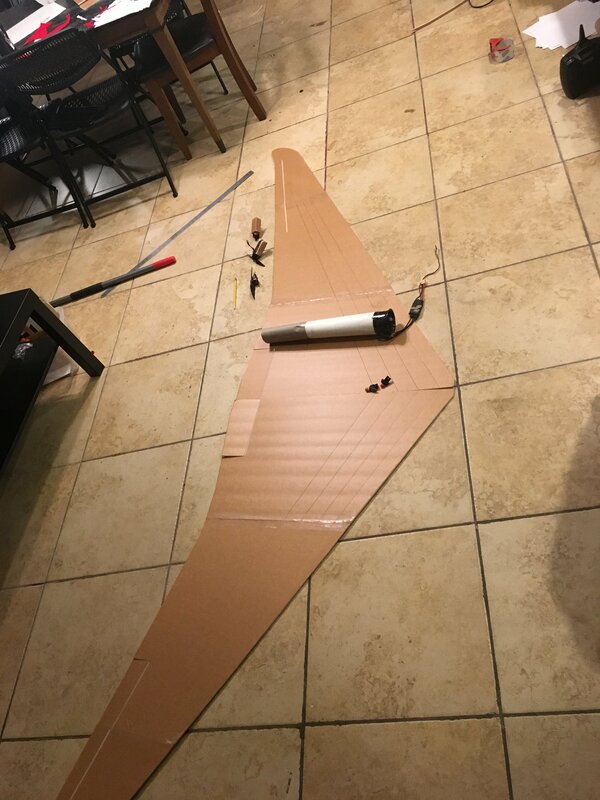 build a 1' center pod with two 30" wings. That sounds like an awesome configuration for an H-4!! But I don't want a mere 6' plane... plus I'm using my 50mm edfs for Korean war jets. I had the 70mms and just scaled the plane to those. From what I'm seeing, you may have trouble controlling this airplane with the control surfaces you have cut out, especially the aileron. Something to consider, on a traditional airplane the tail gives the elevator a lot of leverage to have pitch authority, but on the wing you don't get that leverage. That's why FT's flying wings have such large elevons, they are important to achieve pitch authority. Why don't you move the EDF's back to the middle and use thrust vectoring??? I like the thrust vectoring ide. Would they provide enough authority do you think? Yeah, how exactly would the thrust vectoring work for this? 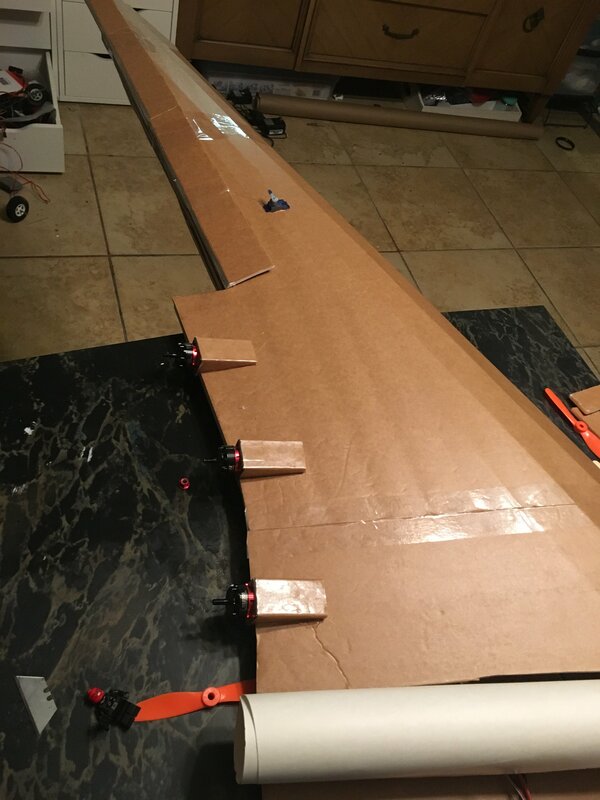 My current plan is to make the wing at a neutral attitude through a combination of downward thrust from the rear propellers and upturned control surfaces. I was planning to use the control surfaces almost more as trim tabs. To be used for slight course corrections, nothing major. But the thrust vectoring idea is intriguing, how would that work? The Valkyrie is coming along. I'm seriously considering attempting a flight without the additional propeller motors. Two 70mm EDFs will have more than enough power to move this thing. But...that's not the point of the challenge. For the spar, I've used about 6 paint sticks. And I've stuck one through each of the EDF tubes. It will lower thrust output, yes, but I need it for structural integrity. Plus, with 6 more red bottoms, thrust won't be an issue. Look hard at the XB-35 and XB-49 for control as well as the B-2. the B-2 uses computers for artificial stability so not the best example but still. looking forward to this. 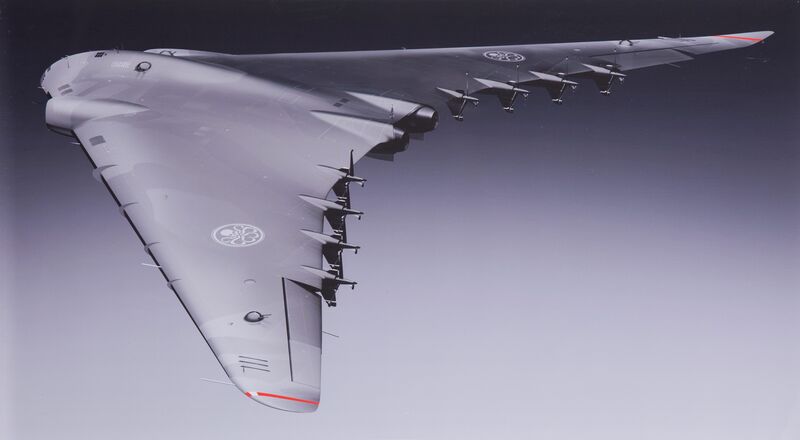 Also note the thrust angle on the XB-35 Photos. This ought to be fun and challenging to fly. Shame my Quintet and the Valkyrie are from different eras. I have, specifically the XB-35. It has small control surfaces which is normally a no-no for flying wings. But I'm thinking its the thrust angle that will provide the nose up force to keep the wing neutral in flight. So that instead of the control surfaces being used to keep the plane level, they can be used to only change its direction of travel. That's what I was hoping you were doing with this, it should work. looks really good so far. There's a few routes you could go. For the EDF's you could put the aft section of the thrust tube on a pivot to give you elevator authority. Hook it up to a servo. I've always wanted to try this but haven't gotten around to it. For the prop motors you can put the motor mounts on some sort of hinge and link them with a servo. I would use metal gear as they will probably need to be a little more hefty, and you don't want to lose it mid flight! Putting the props on a pivot should give you "extra elevon authority"! You don't need to hook up all the motors, just two or four should do it.